Hi, My daughter name is Zyon Janae'. We also call her Ms. Kitty because of her grey eyes. 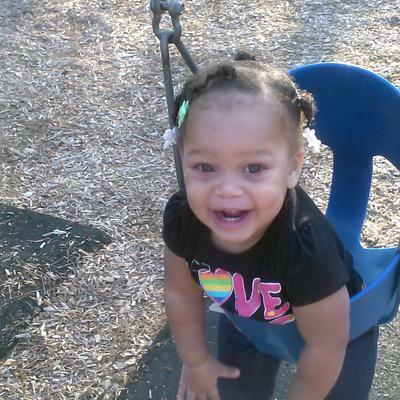 Zyon is a very smart and active 14 month old toddler. She love to sing with her sisters on their karaoke machine. She has a bubbly personality and will put a smile on anyone's face. She loves to talk on the phone ( well try to anyway). She loves to dance and she is very caring. If you are down and sad she will come and give you a kiss to make you feel better. She is such a sweetie pie.